An Alberta court has decided to release the former Guantanamo inmate Omar Khadr, who had spent almost 13 years in custody, on bail. A judge denied the government’s emergency plea to keep the Canadian citizen behind bars. “Mr. Khadr you’re free to go,” said Alberta Court of Appeal Justice Myra Bielby on Thursday, after postponing her decision for 48 hours on Tuesday, when the Federal Crown prosecutor Bruce Hughson argued that his release on bail could do “irreparable harm” to Ottawa’s diplomatic relations with other nations. Captured at the age of 15 and jailed in America’s notorious Guantanamo Bay prison, Khadr was finally released into the custody of Dennis Edney, with whose family he will be living in Edmonton Alberta. While on bail, he will have limited access to family members and only be able to communicate with them in English. He is also prohibited from using the internet. Other restrictions include wearing an electronic monitoring device and observing a nightly curfew. “I look forward to Omar Khadr letting the public see who he is,” Edney said outside the court. Khadr’s bail has been debated since the April 24 order from Court of Queen’s Bench Justice June Ross, which ruled that the former Gitmo detainee, 28, should be granted bail as he waits for the appeal of his war crimes conviction in the US. An appeal hearing is likely to be scheduled for the fall. The young man was detained by American forces in Afghanistan in 2002 and taken to the Bagram Air Base and later Guantanamo. There he pleaded guilty to tossing a grenade that killed Sgt. Christopher Speer, according to military prosecutors. After the inmate was transferred to Canadian custody in 2012, Khadr maintained that he pleaded guilty to the killing because he was “left with a hopeless choice” of either accepting the charges or risk facing “continued abuse and torture” at the hands of his Gitmo jailers. 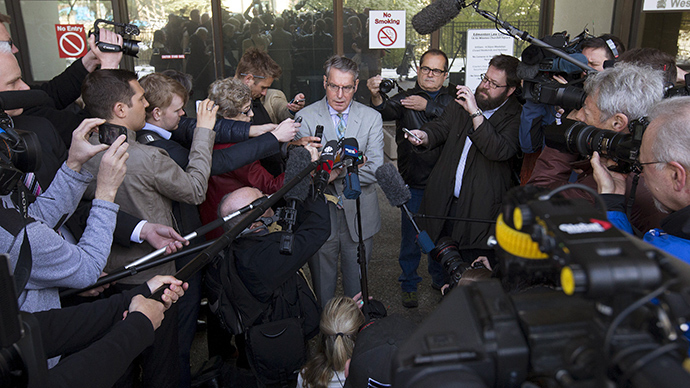 The controversial case of Khadr has split Canadian society. The government sharply criticized and opposed the idea of his release, while human rights advocates such as Amnesty International have argued that Khadr has been denied access to due process since a young age. Meanwhile, spokesman for Public Safety Minister Steven Blaney expressed disappointment with today’s decision. “[We] regret that a convicted terrorist has been allowed back into Canadian society without having served his full sentence,” Blaney said in a statement.